Christopher O’Donnell is the Tampa city hall reporter at the Tampa Tribune, the second largest daily newspaper in Florida. He also covers the Tampa Bay Rays’ battle to get out of their stadium contract at Tropicana Field. Before moving to the Tribune, he was the education reporter for the Sarasota Herald-Tribune, where his reporting on the poor behavior of some substitute teachers led the school district to tighten its hiring and retention rules. His beat reporting was recognized as among the best in the state by the Florida Society of News Editors. But journalism wasn’t originally part of his plan. 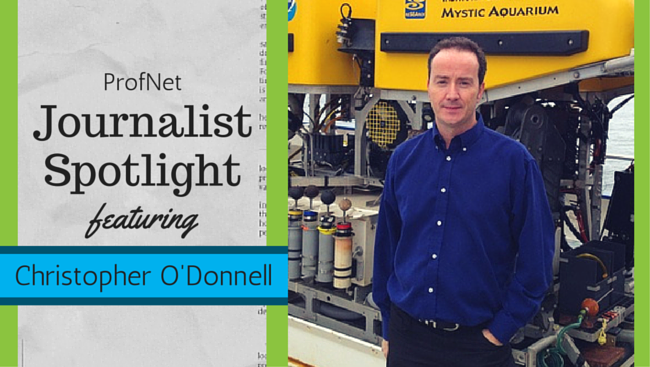 A proud Brit and Londoner, O’Donnell moved to Florida in 2001 and abandoned a career in programming to go into journalism. What led you to journalism? Programming was a job I fell into by chance and one that I thrived in despite my mediocre math skills. Moving to the United States gave me the opportunity to pursue a new career. I had always loved writing and chose journalism because it combined that with my passion for current affairs and politics. What challenges did you face when you left London to work here in the United States? Like driving on the right, it was relatively easy to adapt to the different spelling and that singular nouns take singular verbs even if they imply more than one person. What took a while, however, was to figure out how government, elections and politics work here. The idea that a sheriff or a school superintendent is elected is still somewhat strange. The biggest difficulty was understanding the culture well enough that I can confidently use cultural touchstones in my writing. Imagine an Englishman barely acquainted with baseball with being asked to convey the significance of Opening Day at Tropicana Field. That was me. I will confess that the odd phrase of English-English does slip into my copy. Carpark anyone? I was hired by the Sarasota Herald-Tribune following a successful internship. After a couple of months of being a GA, I was assigned a geographical beat covering a rural old-Florida community upon which development was encroaching. It was tough as there was no press releases, arrest records or meeting agendas to prompt stories. But I unearthed amazing stories like a woman who entered a contest to train a wild mustang in 100 days and a man who won the gig to design the showjumping obstacles for the Beijing Olympics. The beat taught me how to talk to people and show an interest in their community. I learned that stories can be gleaned over coffee (well tea for me), in the thrift store or on the church doorstep. What news do you currently cover? My current beat is covering Tampa city hall, a beat that include politics, budget, transportation, emergency services, real estate development, culture and the regeneration of the city’s poorest areas. I also cover the Tampa Bay Rays stadium dispute with the City of St. Petersburg. Are your stories usually assigned or do you make suggestions as to what you cover? I come up with about 98 percent of my stories. It’s usually only on the rare days that I’m not elbow deep in a story that my editor might ask me to pick something up. What stories do you like covering the most? It’s hard to choose one. I like feature stories because they usually allow more creativity in the telling. I like the rush of breaking news. I like picking up a complex issue and breaking it down for our readers. Is there something in particular you like the most about what you do? I never know when I leave for work exactly how I will be spending my day. Plans are rearranged at a moment’s notice when news breaks and that keeps everything fresh and exciting. Can you tell us about your most memorable or most challenging assignment? I had heard gossip that the legal department of the school district I covered was expensive and wasteful but proving that was not easy. After using outside attorneys for years, the district had created its own legal department arguing that the move would save money and provide a better legal service. I went through budget records going back six years and found that not only did costs soar to pay for two staff attorneys and two legal aides but that, even with in-house staff, the district continued to spend more than $100,000 per year on outside attorneys. Covering a city as large as Tampa involves so many different communities, each with a different history and character, and all with different needs. Being in Florida also means there is no end of out-there stories to spice things up. Do you use social media at work? Facebook and Twitter are now inextricably woven into my day. Elected officials, like anyone else, can’t help but tell the world about their doings and all kinds of news ensues. What has changed from when you began your career? To the benefit of all, many more public agencies now post records online such as city budgets and code enforcement violations. Social media has made it easier for grass-roots groups and activists to communicate to a wider audience and have a bigger impact on issues. That has made it easier for journalists to find non-official sources, a definite benefit.